dependent on several circumstances, most of which seem accidental by now. But only perhaps God knows what 'accidental' means. I would like to begin with Fermi. In 1932, I was still studying physics, but I started teaching as well. I had already obtained my Ph.D. by that time. Fermi had heard about my possible coming to Rome. He wrote a wonderful letter to the Hungarian authorities in which he praised me extensively. 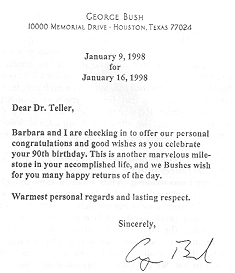 (Addressed to me, he added a line, "Please Mr. Teller, do not take my letter as an insult. Anyhow, I will be glad to see you.") Based on this recommendation, I was granted permission to stay in Palazzo Falconieri in Rome, which was intended to host Hungarian artists and researchers. At this time, Fermi was already busy with irradiating all elements with neutrons. Due to the excess of neutrons, the irradiated nucleus turned radioactive. As Fermi reached uranium, he observed not only a simple radioactive decay, but a multitude of them. Mrs. Noddack was a German chemist who discovered two elements, one of which - rhenium - was existing, but the other - masurium - was non-existent. Mrs. Noddack wrote the following to Fermi, "This multitude of activities possibly means that the uranium nucleus split into two." This made Fermi calculate that possibility, but he concluded that nuclear fission could not be possible. And his calculations were correct. The only problem was that his calculations were based on incorrect measurement of the masses of nuclei. Still Fermi almost discovered fission. What he was looking at was whether the energy of the emitted alpha particles would be larger if the uranium nucleus captures more neutrons. He was observing the reaction with a Geiger counter. On this occasion, he ought to have observed the fission fragments. But, unfortunately, Fermi was good in experimenting, and did not want alpha particles of low energy to disturb the measurements. Thus, he covered the uranium with a thin absorbing foil, so that only alpha particles of high energy could pass through. This was the way he lost the strongly ionizing, highcharged, thus rapidly slowing fission fragments. There was another famous physicist who almost discovered fission: Scherrer in Switzerland. He conducted an experiment similar to that of Fermi, and his Geiger counter indicated enormous impulses. Scherrer called the maintenance department and complained, "The counter functioned all right until yesterday, and today it indicates enormous impulses. It is faulty." It is worth meditating for a moment. In 1932, Hitler had not been in power yet. If in 1932 we knew about fission, it is impossible to tell who would have worked on it further and what it would have been used for. Fission, as we all know, was discovered only in 1938. I, in 1932, knew nothing about it. In 1933 and 1934, I had been working in Copenhagen. Then, in the fall of 1934, I went to England. There a meeting of physicists was held, and Rutherford was the speaker. Rutherford was speaking for ten to fifteen minutes about some crazy people believing in utilizing nuclear energy. "But this was impossible," he claimed. The energy of the nucleus is interesting only for physics itself. It cannot be utilized for anything. I cannot repeat it like Rutherford as he was explaining it for a quarter of an hour, but this was essentially what he said. I could not understand what happened to him. 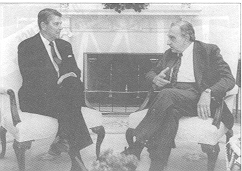 But after this in the very same week, an old friend of mine visited me in London, Leo Szilárd. He was an exceptional person. He did not mind offending people, but he had a very strange principle: One must not bore people. Thus, he never in his life said what he was expected to say. So Leo Szilard told me that he went to Rutherford and told him that nuclear energy can be utilized, and enormous explosions can be generated. As a reaction, Rutherford threw him out. Rutherford got so excited that even some time later the only thing he could talk about was proving what nonsense this idea was. Szilard explained to me that the question was very simple: Is there a nuclear reaction that starts off by capturing one neutron and at the end produces more neutrons, then a sequence of these reactions may result in selfsustaining chain reaction. Szilard was so much hurt by Rutherford's refusal that he decided to get a patent on the idea of a neutron chain reaction. That he was granted. A few years later he sold his innovation to the American government for $20000 - rather cheap. But in the patent, he had to describe exactly with what he created the chain reaction and how. He mentioned uranium, thorium or beryllium. Why did he think he could have a chain reaction generated with beryllium? The same thing happened to him that happened to Fermi. He used the results of Aston's mass spectrograph measurements, and based on the E = mc2 formula, he concluded that energy will be released in the n + Be9 2He4 + 2n reaction. But Aston's measurement contained a slight error. It is true that beryllium is not far from being able to produce energy, but still it does not. The great discovery was still a few years away, but it is a fact that a good four years before the discovery of fission, Szilard already understood the essence of it: Nuclear energy can be obtained simply by accumulating the critical mass of the appropriate material. Everybody knows that this became possible in the uranium nucleus because as a result of neutron-irradiation, this nucleus can split into two parts due to the Coulomb-repulsion. Fermi already saw this phenomenon, but he did not understand what he saw. Fission was finally discovered in the Kaiser Wilhelm Institute in Berlin at the end of 1938. In Washington, D. C. at the George Washington University, we had a conference once a year. In 1939, Niels Bohr also joined the meeting. The night before the conference, my friend George Gamow, who was also lecturing there, rang me and said, "Bohr has gone crazy! He says the uranium nucleus splits." The thought that came to my mind: Perhaps Bohr is not crazy at all, perhaps the uranium nucleus will really split into two. The next morning, Bohr explained to us fission, and almost immediately the warning spread among us: Let us not discuss this issue in public. It may be too interesting, even dangerous. Back in Copenhagen, Bohr had already heard that in the Kaiser Wilhelm Institute (Berlin), some fission fragments were identified; for example, barium and iodine. Frisch and Meitner observed the high energy of the fission products. The results of the experiments were relayed to Bohr when he was already on the ship en route to America, and Bohr told us at the conference. Following this, the Carnegie Institute for Terrestrial Magnetism repeated the experiment. It was unbelievable. The experiment is one of the easiest to perform. It still took years to understand what was actually happening. More and more people started to repeat - the possible consequences must be carefully considered. Fermi himself, together with the American Tuve, went to visit the headquarters of the U.S. Navy and recommended this to be investigated further, but they were not listened to. Leo Szilard was a versatile person. He was even capable of explaining this to the American leaders. It was even possible for him to persuade them to start working on the issue. There was one thing that even Szilard could not do: Drive a car. In the summer of 1939, I was working at Columbia University in New York just like Szilard. One day, Szilard came up to me and said, "Mr. Teller, I am asking you to drive out with me to Einstein." (We were not on a first name basis. We had been very good friends, but I never was Edward or Ede; to Szilard I was Mr. Teller.) Einstein was vacationing. So we drove out on the 2nd of August. The only problem left was that Szilard did not know where Einstein was staying. We started asking around, but nobody knew. Finally, we asked an 8-year old little girl - she had a vice ponytail - where Einstein was living. She did not know either. Finally Szilard said, "He is that old man with long white hair " The young girl's response, "He is living in the second house!" We entered. Einstein was cordial, offered tea to Szilard, and being democratic, he invited the driver in as well. Szilard pulled a letter from his pocket. Einstein read it slowly and said, "Well this will be the first case when we use nuclear energy directly, not indirectly as the Sun is producing it and we are gaining it from the Sun." With these words, he signed the letter, "Albert Einstein." Szilard never mailed this letter to President Roosevelt; that would have been a mistake. The letter would have ended up in the hands of a secretary, and the President would never have seen it. Instead, as I said, it was at the beginning of August, Szilard handed the letter to one of his friends, a banker, who knew the President personally. Roosevelt received the letter in October. He could not have received it at a better time. It happened when Nazi Germany and the Soviet Union had already occupied and divided Poland. By that time an intelligent man like Roosevelt could clearly see: The great danger is here, the danger is on our doorstep. He immediately wrote to the bead of the Bureau of Standards, Dr. Briggs, "Convene a meeting to discuss the contents of the letter in detail." Besides Szilard, Wigner and Fermi, I was also invited to the meeting. Fermi sent the message that he would not come. He had already been to the Navy where he was not listened to; he was fed up. But they knew that I had known Fermi from back in 1932 when he so cordially invited me. (The truth is that at that time I beat Fermi in table tennis several times. In a very impolite way. He only won once, when I was playing with my left hand, and when he showed pride on this victory, I was showing him my left hand. Still he did not get annoyed with me.) So they Bent me to persuade Fermi to come to the meeting. "I am not coming." Come! "I am not coming! Why should I? What I have to tell them is very simple; you can tell them as well." So I went to the meeting as I had been promoted. I was not Szilard's driver anymore, but Fermi's messenger. We were sitting there. There was a high-ranking officer there from Aberdeen, and he did not believe a word of what we were talking about. He said he did not believe things like that, he did not believe in death rays either - of course, at that time, there was no laser at all. "In Aberdeen," he said "there is a goat tied to a post with a rope of ten feet in length. We offer $10000 to anyone killing this goat with a death ray. But the goat is alive and well, and on the other hand," he said, "wars are not won by those having better weapons. Wars are won by those who fight for the right cause." This was very pleasant to hear from a high-ranking military officer, but we had doubts. Did Hitler and Stalin fight for the right cause in Poland? Different topics had been discussed, and finally it was my turn. Then I said what I had to say, " I am bringing Fermi's message: Graphite is needed for the work. Graphite is cheap, but we need purified graphite, very clean, and to have it purified so well is not a cheap thing. We work at the University, we need not be paid, but to get clean graphite, money is needed. $6000 for the first year." Following the meeting, Szilard almost killed me for asking for such a small sum, but we were given the $6000. This was the first year budget of the nuclear energy program. This did make a bit more sense than it would, seem at first glance. Consider what was going on in Germany in the meanwhile. The bead of the German venture was their best man, Heisenberg, who used to be my professor. The Germans also tried to build a reactor. The Germans also thought about slowing the neutrons for this purpose, and the best idea would be to use graphite. One very good physicist of theirs, Bothe, measured the neutron absorption cross section of graphite and found that it was too big. Somehow it did not occur to them to use highly purified graphite to make the chain reaction possible. They decided to choose a much more difficult alternative: They started working with heavy water. I have a point to make here. Heisenberg was my professor. What I am about to say is perhaps subjective. I appreciated and liked my teacher, Heisenberg, who elaborated perhaps the most important chapters of quantummechanics. During the summer of 1939, he visited America. And many, including myself, were asking him to stay. But he said, "If my brother stole a silver spoon, he is still my brother." Unfortunately, Heisenberg proved to be wrong. What his brothers, the Nazis, did was a million times worse than stealing a spoon. And Heisenberg had to pay a high price for that. But he was a good German, and stayed at home. Never did I know anybody else striving more intensively to perform perfect work than him. Heisenberg did not commit mistakes even when playing the piano. When it was physics, there was absolutely no room for mistakes. But then why did Heisenberg not tell Bothe, "This experiment is important Are you sure this graphite is really pure?" I am sure Heisenberg was involved in sabotage. I am not only saying (though this might be true as well) that Heisenberg at this time was not trying that hard. I do not believe so. Heisenberg had an entirely different nature. He was not simple, but he was a strong and clear character. I believe Heisenberg was sabotaging. After the Germans took Copenhagen, Bohr's life was in danger. Later he fled to us in America. Before having left Denmark, Heisenberg, whom the Nazis did not entirely trust (he almost ended up in a concentration camps), visited Bohr. While conversing in the Karlsberg castle where Bohr was living, Heisenberg said, "I am working on the War for my country, and this is good." I think Heisenberg said this since he knew that what he said was bugged by the Nazis. I know all this from a close friend of mine (and of Heisenberg as well), Carl Friedrich von Weizsäcker. Later they went for a walk in the garden. There Heisenberg told Bohr, "I am working on nuclear energy and I hope l will not succeed. I also hope that the Americans will not succeed either." I can prove this also in another way. When in the spring of 1945 we defeated the Nazis, the English took approximately ten first-class German physicists to a farm in England. They were kept there for months. Their conversations were bugged, but this fact was kept top secret, even more so was the content of the conversations. It was only two years ago when the text of the conversations was made public, I got hold of a copy of this. What I want to explain emphatically is what the German scientists said when on the 6th of August they were told that the U.S. dropped a nuclear bomb on Hiroshima. The Germans did not believe it, "How could this have happened? Did the Americans drop a reactor?" A few hours later, Heisenberg asked his friends to convene, "This was an atomic bomb, and an atomic bomb operates this and that way." I deem it very important and interesting that Heisenberg here committed another mistake. He described how an atomic bomb works and said, "The efficiency of an atomic bomb is very high as radiating energy is emitted at very high temperatures very fast. Thus, the fissionable material can stay together, neutrons tan multiply further, and generate further fissions." When I was working on this, I had the same thoughts. After a few days though, I realized this was not true. I realized that opacity is big enough to keep the energy inside, thus quick transfer of heat by radiation was not happening. The bomb, due to excessive heat, will heatup and blow-up, and the chain reaction will be stopped sooner. In the course of our work, this problem was raised by me. We agreed with Oppenheimer, director of the laboratory at Los Alamos, that the leakage of energy is most probably insignificant, but we cannot be sure of that. As we had a lot else to do, Oppenheimer suggested that I go and find people who would calculate this correctly. So I went. A friend of mine, Maria Mayer, did the calculations with two students, but I did not have to tell them for what purpose. But she asked, "What temperature should we calculate at?" When I told her, shock and surprise were visible on her face, but she did not say a word, did not ask a question. She knew what the issue was, but I did not tell her. Neither did she tell me what her thoughts were about it. This was also part of keeping secrecy at that time. Just to return to Heisenberg: An extraordinary physicist like Heisenberg committed this mistake. This had to be a mistake for sere, as to the other Germans, he wanted to tell the truth. If he previously had been thinking about this for a week, he would have realized the mistake. He knew there was energy enough for the nuclear explosion, but he did not think about its details before Hiroshima. He was not really interested in this issue. This was not a task he wanted to deal with. There was one question left. It might be superfluous, but anyhow I will mention it. Following the War, why did he not tell he was committing sabotage? I tan only say what in my view derives directly from Heisenberg's character. Admitting this before the end of the War would have been equal to suicide. Talking about this after the War would have seemed self praise. Many of Heisenberg's friends were against the Nazis. Some of the friends sided with the Nazis. Heisenberg had the possibility of staying honest and clean by' not saying a word about this. A few years later he died, according to my knowledge, as a result of lung cancer. Weizsäcker told me that Heisenberg told him before his death, "I have nothing to regret." I am also of the same opinion: He had nothing to regret. We had been working in the U.S., and we had results at an early date. This is due to the idea of implosion, in which the calculations of Johnny von Neumann, visiting Los Alamos frequently, had a great share. Working with the latest computer helped a lot. Hungarians were also involved in this project. Sometimes it was thought that we Hungarians talk Hungarian too much amongst us, and this was not appreciated. But this was not true. Johnny and I talked Hungarian when we were alone. On one occasion, General Groves got really upset as two children were talking Hungarian in the middle of Los Alamos. But there were no Hungarian children in Los Alamos at all! Who could these kids be? It turned out that the two sons of Felix Bloch were conversing in Sweitzer-Deutsch, but Groves could not differentiate this from Hungarian. By the time we were ready in Los Alamos, Hitler had already committed suicide. In Chicago, they were working on producing plutonium. Their job was finished earlier: In Hanford (Washington State), the plutonium-producing reactors had already been built and operating. Szilard, Frank and a few other good physicists had already discussed what to do next. I received a letter from Szilard, "We are working so that the Nazis do not get ahead of us. But the Nazis are finished. If we use this weapon in a way that kills many people, it might have unforeseeable results. It would be better to open the nuclear age in a way that better suits our principles. Let us request the President not to use the atomic bomb against the Japanese. Let us rather show it to them, and they might surrender Would you sign this request, would you collect more signatures?" I would have signed, but I did not dare to collect more signatures without asking Oppenheimer, the director of the Los Alamos laboratory. Oppenheimer was a good physicist, and we all knew that. The work of Born and Oppenheimer on the distribution of energy between the motion of the nuclei and the motion of electrons was only the first in many of his excellent contributions. He was good in politics as well, and as head of the laboratory, he performed an enormous amount of organization work. Our results depended on the ideas of many thousand people. Oppenheimer knew the weaknesses and merits of each and every person. He also knew what was behind the successes and failures. His character had a strong effect on every individual. I went to him and showed him Szilard's letter. Oppenheimer was normally a careful person who expressed himself moderately. But this letter apparently annoyed him, "So what does Szilard know? What does Frank know to interfere with political questions like that? First class people work on this in Washington, they understand the Japanese, they know what to do. We technical people, engineers, scientists should stay' with our own business, we should not interfere with politics." I very much regret Oppenheimer persuading me on that occasion. I wrote Szilard a letter, "I wanted to work in support of the case. But I know how difficult the decision is, so I have to stay with what I am an expert in." Our letters were censored. I knew my letter would most likely go first to Oppenheimer's desk, thus I did not mention my discussions with Oppenheimer. These happenings meant a lot to me personally. I saw how many people died in Hiroshima. A few months later I learned that Oppenheimer participated at an official, closed-attendance meeting. Four physicists participated: Oppenheimer, Fermi, Compton and Lawrence. This meeting figures in Compton's book, Atomic Quest. He described that at this meeting Fermi was very cautious. Fermi generally thought that he had to stick with the majority because he was no expert in American politics. Thus Fermi kept silent. Compton and even more so Lawrence thought that the bomb had to be demonstrated. Oppenheimer in the end persuaded everyone to report that, according to the opinion of the committee, the atomic bomb had to be used immediately Too me he recommended that we do not interfere. This influenced me. In the meanwhile, he had a definite view of using the bomb that he represented actively! I need to add two notes. One is: Nothing that I would have done at that time would have mattered. 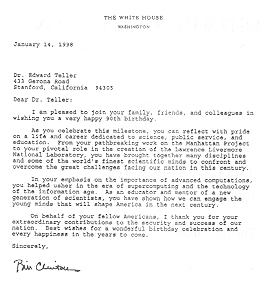 The other one (less clear): What Oppenheimer, what these four physicists recommended never got to President Truman's desk. What they recommended, so I believe today, was a great mistake, but what happened, happened independently of this mistake. Another friend of mine, Lewis Strauss (later appointed head of the Atomic Energy Committee), wrote a book: Men and Decisions. If features a chapter on Hiroshima. It is almost enough to quote the title of the chapter: A Thousand Years of Regret. We will have to regret for a thousand years what happened. It is strange that Lewis Strauss generally supported development of weapons but was against this bombing. On the other hand, Oppenheimer, who following the War, wanted to stop all nuclear weapons research and development, was for the dropping of the bomb. Ninety-five percent of the physicists working in Los Alamos were of Oppenheimer's view: They wanted to use the weapon, and after that they wanted to stop further developments. For most of them, development and use of a weapon went together. On the other hand, there were some who wanted to develop the power, but wanted to limit the use of power. This became my view as well. But this opinion at that time was in minority. I will continue telling what I read by Lewis Strauss and elsewhere. The most important person in Japan was Emperor Hirohito, and he opposed the War. At the end of June or the beginning of July, he sent one of his relatives, Prince Fumimaro Konoye, to Moscow with an offer for peace. The offer was barely different from the end result: "We have only one condition, the Emperor stay on his throne. Otherwise, we in Japan are ready to do anything the Americans want." Even before the War, the American Navy had a great success, they broke the secret code of the Japanese. This was later changed by the Japanese. But when the rules are changed, all commanders have to be notified, and this could happen only through the old secret code. Thus. the American Navy could throughout the War follow what the Japanese told one another. Lewis Strauss was serving in the Navy at that time. The Navy and he knew that Fumimaro Konoye was asking for peace in Moscow. I know it from a reliable source that neither the recommendations of the Oppenheimer group, nor the information the Navy possessed. ever became known to President Truman. In the middle of July, Truman traveled to Potsdam. It was there where he learned that our first experiment with the atomic bomb was successful. He knew that following a terrible War, Europe was facing a terrible winter. Perhaps the whole of Europe will become Communist. America has to help, but it is impossible - or almost impossible - to help while fighting the Japanese. The War has to be ended quickly. The U.S. has a new weapon at hand, it has to be used. This he decided on his own. Not entirely alone. He asked one man, a clever man: Churchill. He said the same thing. Thus the decision was made - that I regret. Let us imagine, as I did, too late though, but I did, without the possibility of having any influence, that the first atomic bomb is dropped over the Tokyo Bay, and it exploded 10000 meters high. We could have done that. We were able to calculate what effect this would have had. We knew if we did this during the evening hours, 10 million people would have seen how evening darkness is turned into noontime brightness, and no deaths would have occurred. We also know now, having dropped the bomb, what effect this had in Japan. Japan at that time was governed by a small cabinet: Six people. Following Okinawa, everybody knew that Japan had lost the War. Three members of the cabinet wanted peace without conditions, the other three wanted to "continue fighting for a better peace." And Hiroshima did not change a vote - the split stayed 3:3. This was the opinion relayed to the Emperor. He wrote a speech with the intention of delivering it to Japan and the world. But the followers of the pro-War general formed a coup: They locked the Emperor up, searched for the speech, but did not find it. The bead of the group forming the coup wanted War, but, was loyal to the Emperor. He did not agree with forcing the Emperor so he stopped the coup. Prior to the bombing of Nagasaki, Emperor Hirohito wrote his cease-fire speech. I believe there was no need to drop the bomb on Hiroshima. I am sure there was no need dropping the bomb on Nagasaki. The speech of the Emperor was delivered: "We, the Japanese should do the impossible - ask for peace." They pleaded peace. The general, having withdrawn his followers from the Palace, went home and committed suicide. Had the Emperor seen the effects of the atomic bomb, had we told the Japanese to surrender or otherwise such weapons would kill people in two weeks, I take it for granted we could have reached peace without loss of life. The War ended without many millions of American soldiers going to Japan. We did not have to attack Japan, no 100 000 Americans had to die in this attack. Japanese deaths did not have to amount to unbelievable counts. A terrible War was over, and this helped forget all other problems. But years passed, and people started to fear. Prior to Hiroshima, perhaps a thousand people knew what was going to happen. But after Hiroshima, many billions of people did not understand how this miracle could have happened in Hiroshima. It was impossible to explain to them as people were made to believe that things not understandable in five minutes are impossible to understand at all. And it could have taken two hours to understand what an atom and a nucleus is. But who is performing things like that nowadays? The press could explain. But bombastic headlines and fear fitted much better into what the press was doing so lightheartedly. From little fear, much more fear stemmed. They started to fear atoms and radiation. Nowadays, we ban radiation if it is just a little bit more than what everybody receives. And that is not the end. Later on, we started to fear compounds that kill harmful insects like mosquitoes but are perhaps dangerous to people. Then we started to fear freon without ever really investigating if we had a good enough reason to fear or not. Two hundred years ago, Malthus (when there were only 1 billion people living on Earth) already said that the growth of population will result in trouble. In the meanwhile, the population of our planet increased more than five times and the wealth of people increased as well. Fertility of people is great. Their resourcefulness is even greater. I love people. If there are three infants born every second, may God bless them. In case we use our resourcefulness, we can all make a living. I fear only those who fear. Roosevelt already said during the depression, "We need not fear anything but fear." Fear has to be feared. Our society, the West, America, Germany and Hungary, cannot live in peace unless the results of increasingly developing technology are utilized. But if we fear, we dare not utilize. I believe Hiroshima was a serious mistake. This is important to understand. We need to understand that we in science, universities, schools have three major tasks: Knowledge has to be increased under all circumstances; the utilization of knowledge has to be carefully elaborated, and third; what we find out, we have to explain in depth. These are the boundaries of our responsibility. In a democracy, the decision has to be made by the people, in practice by those who have been elected by the people. In this, we have to help, we have to enlighten. One who is always right but has no joy in it, is a pessimist. An optimist is one who considers the future to be uncertain. I claim that being an optimist is an obligation, because if - as a student of Heisenberg - I believe that the future is uncertain, then our responsibility is increased to do what we consider bent. In this forming of the future, the role of the professional is particularly great. There are no boundaries to knowledge, and no boundaries should be raised. The final decisions have to be based on knowledge. If we in Hungary do understand this, if we explore the new possibilities of nuclear power, biochemistry, if we utilize this to produce energy and develop agriculture, Hungary will much more easily overcome present difficulties. The scientists might have an enormous role in this, in case they clearly understand that their role is increasing knowledge and providing advice. The responsibility of the decision in the end must be in the hands of the people. 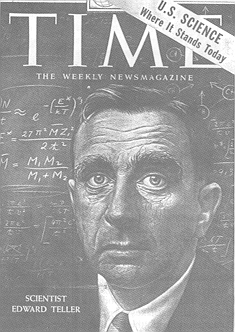 Lecture of Edward Teller, Honorary Member of the Eötvös Society (delivered at the Eötvös University in Budapest on 25th November 1993) Printed in Hungarian in the Fizikai Szemle 1994/1 p. 1.